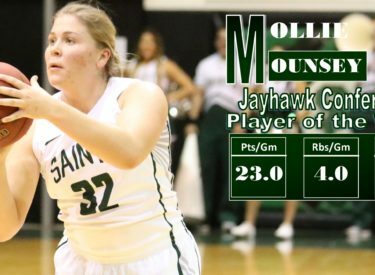 Leading the Lady Saints to a pair of wins last week, freshman guard Mollie Mounsey has been named the Jayhawk Conference Player of the Week as announced in a league release on Tuesday. Sharpshooting Mollie Mounsey came up big for the Lady Saints in a pair of tight ballgames this week, scoring a career high 28 on Wednesday in a one point road win over #17 Cowley while pitching in 18 with 8 assists Saturday night in a three point victory over Coffeyville. On the week Mounsey averaged 23 points per game, shooting 46% from the field. Mounsey currently leads the Lady Saints and ranks third in the Jayhawk Conference in scoring at 18.3 points per game and has rained in 35 three pointers which is second best in the league. Mounsey and the Lady Saints will hit the road Wednesday night to take on the Allen Red Devils in Iola before returning home Saturday night to take on Neosho County in their first semester finale.